Back in early June, the New York Dept. of Financial Services posted the requested 2018 rate hikes for the individual and small group markets. In most states, the CSR reimbursement issue is a much bigger factor than whether or not the Trump Administration enforces the individual mandate, but in New York it's the exact opposite: According to the NY DFS, loss of CSR payments would only tack on 1.3 points to the total, while "a full repeal of the federal individual mandate would increase rates by an additional 32.6%". The reason for the fairly nominal CSR factor is that the vast majority of NY's CSR-eligible population (those earning 138-200% FPL) is instead enrolled in the state's Basic Health Program. As a result, only 26% of New York's exchange enrollees receive CSR assistance, and the 200-250% FPL recipients only receive a fairly skimpy amount of CSR help anyway. At the opposite end of the spectrum, the 32-point mandate factor is far higher than most carriers are indicating (more like 4-5 points), but there's a big difference between the administration "not enforcing" the penalty and outright repealing it, which NY DFS is talking about. In any event, this means that NY's requested average increases boiled down to: 15.0% if CSRs are paid/mandate enforced, 16.6% if CSRs aren't paid/mandate is enforced, or a whopping 50.5% if CSRs aren't paid and the mandate was repealed. I already addressed the reason for the "55% lower than 2013" bullet point: New York was the only states to legally require both Guaranteed Issue and Community Rating on the individual market before the ACA (several other states required Guaranteed Issue only)...but they didn't include financial assistance or a mandate penalty. As a result, pre-ACA rates averaged over $1,000 per month per person, causing the entire individual market to plummet to just 17,000 people state-wide. Financial Services Superintendent Maria T. Vullo today announced the 2018 health insurance rates for New York’s individual and small group markets, including rates for the NY State of Health, New York’s official health plan marketplace. The Department of Financial Services (DFS) reduced insurers’ requested 2018 rate increases by more than 3.8 percent overall for individuals, which will save policyholders more than $59 million. 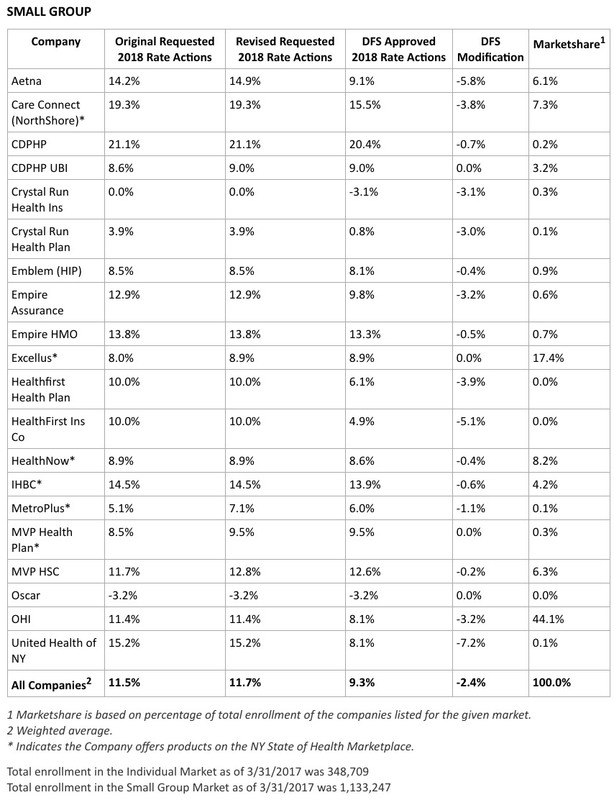 The overall average 2018 cost of coverage for individuals who purchase the lowest cost silver level plans – the most popular choice for individuals purchasing on the Marketplace – among NY State of Health enrollees will decrease by as much as 5 percent compared to 2017 rates when federal tax credits are applied. For small group plans, DFS reduced insurers’ requested 2018 rate increases by 2.4 percent, saving small businesses approximately $166 million. More than one million New Yorkers are enrolled in small group plans. Since the ACA, New York has cut the uninsured rate in half and rates for individual coverage are 55 percent lower than they would have been without the ACA, after adjusting for inflation and not including federal tax credits. ...The current federal administration continues to threaten the ACA’s Cost Sharing Reduction (CSR) subsidies for insurers. Superintendent Vullo has submitted a declaration in a pending lawsuit seeking to compel the federal government to pay these subsidies. DFS will continue to fight for payment of the CSRs so that consumers are not further harmed by federal government actions. However, in light of the ongoing uncertainty regarding CSR payments by the federal government, including guidance issued by the Center for Medicare and Medicaid Services (CMS) on August 10, 2017 regarding federal risk adjustment related to CSR, DFS is granting an additional rate factor based on information that insurers had provided to DFS in May 2017 that estimated potential funding loss. The additional factor only applies to the individual rates of silver plans. Repeated efforts by Congress to repeal, or repeal and replace, the ACA have sought to destabilize the ACA marketplace, and caused some insurers to raise rates to account for the uncertainty. Moreover, administration attempts to repeal or not enforce the ACA’s individual mandate likewise have caused destabilization of the market. As a result, fewer younger and healthier individuals are purchasing coverage, impacting the risk pool and causing premiums to rise. Congress also defunded the ACA’s Risk Corridor program, which would have limited insurers’ potential for losses as the ACA was implemented. ...Underlying medical costs continue to be the main drivers of premium rate increases, reflecting a nationwide trend. For the 2018 individual rates announced today, drug costs account for the largest share (26 percent) of all medical costs, with specialty drug costs increasing about 49 percent. Inpatient hospital costs account for the second largest share of medical expenses (19 percent), followed by physician specialty services (12 percent) and diagnostic testing/lab/x-ray (10 percent). ...New Yorkers will continue to have comprehensive healthcare coverage, regardless of federal action. In June, Governor Cuomo directed DFS to promulgate new emergency regulations mandating that health insurance providers do not discriminate against New Yorkers with preexisting conditions or based on age or gender, in addition to safeguarding the 10 categories of essential health benefits guaranteed by the ACA. Earlier this year, DFS took action to ensure that all medically necessary abortion services are covered by health insurance policies without cost sharing and that contraceptives are made available to women with no co-pays or deductibles in amounts exceeding one month’s supply at a time. These first-in-the-nation measures will ensure that essential health services are protected and covered for all New Yorkers. The Governor also issued an executive order that bans all insurers who withdraw from offering Qualified Health Plans on the NY State of Health Marketplace from future participation in any program that interacts with the Marketplace, including Medicaid, Child Health Plus, and the Essential Plan. The order also directs state agencies and authorities to ban insurers who withdraw from the NY State of Health Marketplace from contracting with the state and to consider all available actions to protect New Yorkers’ access to quality healthcare. Approximately 350,000 New Yorkers are enrolled in an individual commercial plan. DFS reduced insurers’ total weighted average increase requested for individuals from 17.7 percent to 13.9 percent. These rates will be reduced for many consumers due to federal tax credits. For example, overall average 2018 cost of coverage for individuals who purchase silver level plans – the most popular choice for individuals purchasing on the Marketplace – will decrease approximately 5 percent compared to 2017 rates when federal tax credits are applied. Yep, when you include off-exchange enrollees, NY's individual market is now over 20x larger than it was in 2013. As noted above, many of the ACA's carrier regulations were already in place pre-ACA (guaranteed issue/community rating). What changed was the addition of financial assistance and hte individual mandate penalty...i.e., the 2nd and 3rd legs of the stool. Rates for individuals are more than 55 percent lower than prior to the establishment of the NY State of Health in 2014, adjusting for inflation but not counting federal financial assistance that the ACA makes available to many consumers purchasing insurance. Under the ACA, financial assistance through federal tax credits for those who qualify will increase in 2018. Households between 200 percent of the federal poverty level, which is the highest level to qualify for the Essential Plan, and 400 percent of the federal poverty level ($48,240 for individuals and $98,400 for a family of four) qualify for federal tax credits, which will reduce premium costs. In 2016, nearly 60 percent of individuals who enrolled in a Qualified Health Plan on the Marketplace received financial assistance, which significantly mitigated the impact of premium increases for these individuals. These rate increases will not impact the Essential Plan, available only through the NY State of Health, which will still have premiums of $20 or less for lower income New Yorkers who qualify. More than 650,000 New Yorkers are projected to be enrolled in the Essential Plan in 2017. Information about the Essential Plan, including income levels and the services it covers, is available here. More than one million New Yorkers are enrolled in small group plans. Insurers requested an average rate increase of 11.7 percent in the small group market. DFS cut the requested rate increases by 2.4 percent to 9.3 percent for 2018, saving small businesses $166 million. A number of small businesses will also be eligible for tax credits that may lower those premium costs even further. 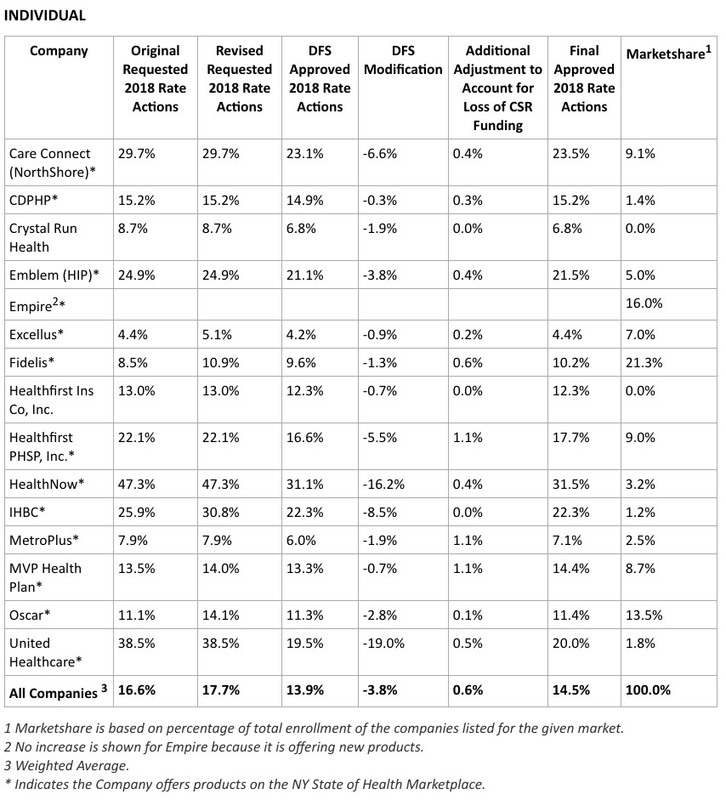 Note that NY DFS even whittled down their estimate of the CSR impact further yet, from 1.6 points to just 0.6 points.